In order to get to a certain level of satisfaction in our lives, we are faced with sacrificing certain things. Our relationships, our health, our lives are tested when sacrificial situations are introduced. Sometimes sacrifice is seen as a negative component; however, the action and the outcomes are cherished after the fact because you see the result of those sacrifices. Our relationships, health and lives will sustain if we make smarter decisions. Sacrifice comes from two Latin words: “sacrum” and “facio”. It literally means, “to make sacred”. There is nothing wrong with making sacrifices for the life you desire for you and your family. When you are willing to make sacrifices, that means that you truly care about those for whom you are making them for! YOUR RELATIONSHIPS, YOUR HEALTH, AND YOUR LIFE ARE “SACRIFICE”!! HERE’S A STORY: With the support of my husband, I decided to pursue my doctorate degree. We had no idea what it would entail, but we were ready to sacrifice our time for it. Mind you, we had date nights and were very spontaneous with outings and gatherings. When school work became intense, Jay would tell me to put work to the side and get away from it. It was SO hard to do because I felt I needed to stick it out, but I sacrificed my own feelings and went along with his advice, which was the best advice I could have taken. At that point I made the decision not to do school work on the weekends and it helped me mentally and socially, as date nights returned. In 2010, in the midst of the first year of my program, we found out we were pregnant. We weren’t planning to have children until the program was over (3 years later); however, God gave us a blessing. I was a little panicked because I was faced with the decision to stop the program or keep going, not knowing how I would get through. I was willing to sacrifice the pursuit of my degree to raise our family. Jay told me that I could handle it. He always saw more in me than I saw within myself. I sacrificed time again to get work done sooner, so once the baby was born, we could focus on family. Honestly, the initial change from date nights all of the time actually prepared us for the time change we would experience with a little one added to our family. Time well spent, however. Jay made the decision to sacrifice his time as a photographer to dedicate to our family as well. He didn’t really book gigs for almost an entire year. I could see that he ‘lost’ something. I supported him to get back into the swing of things and you could see the change in him to return 1) to what he loved to do and 2) to be able to support our family doing it. He sacrificed his love in his craft for his love for us. Some would say, “Isn’t that obvious?”, but you still don’t want to ‘lose yourself’ in general. Then in the beginning of 2012, as I am approaching the end of my program, we are blessed with child number two!! Again, we found ourselves pinching our time to ensure that I could knock out school work and graduate earlier in order to enjoy both of our little angels. It had it’s rough spots, let me tell you, but nothing that would complicate our lives or our relationship. Today, I am finished school and working to build my business; Jay is continuing with photography with an added focus in fashion shoots. Both are VERY time consuming, but we make it all work and we make these sacrifices, not only for each other, but for the love of our family!! We MAKE time for each other; we MAKE time for our kids! We can’t get to everybody’s events, but they know that we love them 🙂 There is just new foci in our lives and we wouldn’t change it for the world. Our love and family is the result of Jesus’ Sacrifice. We look forward to what God has for us via our sacrifices as well! 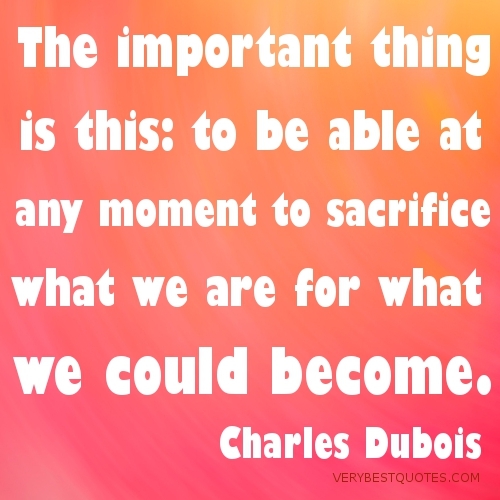 SACRIFICE CAN BE A GOOD THING; JUST MAKE GOOD DECISIONS!